The lovable hunchback campanologist leaps his way onto the Amiga in time-honoured style. For those not familiar with this ageing game, a quick resumé is doubtless in order. Kwasimodo's true love, Esmeralda, is being held captive in the dungeons of the Wicked Warlord, and he has taken it upon himself to rescue her. This he can only do by traversing the tops of 25 walls which are inhabited by the Warlord's minions, who thrust and throw items of period weaponry at our hero, all of which spell doom should the impinge upon his person. The wall itself presents hazards to be jumped across in the form of castellations and extending brick bridges. All of these must be overcome for Kwasimodo to complete each level. Signalled by the ringing of a bell on the far right of each screen. At this, the screen scrolls across and the next level stands ready to be tackled. Anyone releasing a Hunchback clone these days has to be rather hopeful - the genre died a death about four years ago! 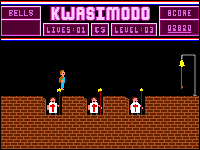 I wouldn't mind if it was playable, but Kwasimodo is complete and utter crud. The infantile graphics show a frighteningly retarded talent, and are akin to something an idiot child would draw on a badly programmed art utility for the Texas TI-99. The programmers must have worked very hard to make the sound chip produce such a vile cacophony - the one-channel tune could have been sampled from a badly tortured Stylophone. Bemoaning the archaic gameplay, ropey collision detection and cretinous multiload system seems almost to be kicking this spineless software cripple while it's down. If you think spending £10 on a game that even an Oric owner would scoff at is fun, buy this now. If, on the other hand, you've got all your marbles, treat Kwasimodo with the contempt that it deserves. Well, what can I say except, 'Oh dear'. We've seen some pretty poor Amiga games this month, but this one really takes the biscuit. The spirit of the original Hunchback is more or less there, but it was never much of a game to start with - certainly not enough to make up for the terrible appearance of this 16-bit incarnation. The graphics are so simply drawn and animated that they quickly become the object of much amusement and derision. Take the guards on the walls for example, with their inane grins and telescopic spears, or the ridiculous Kwasimodo sprite, which looks like he has a bouncing sack of mail on his back. The real joke is the high score table, which placed my first score of 2,700 above the top score of 10,000. Yuk, yuk, yuk! Unfortunately, the laughing has to stop when you realise that this 'budget' product still sets the consumer back a tenner. Our poor old Amiga must feel really tortured having to wrap its multi-tasking dedicated chips round this digital sewage. I'd love to hear the logic which deemed Kwasimodo fit for distribution and, dare I say it, purchase. The graphics are a joke: from an unbelievably simplistic title screen, you're sadistically dragged to the in-game graphics. The backdrops are unforgivably colourless and hopelessly blocky; the main sprite lacks any character or decent animation and the soldier sprites are basic to say the least. The sound, however, is beyond a joke: purile tunes whimper along, one discordant note at a time, adding to the overall impression of ineptitude. Even the version of Hunchback I played on the humble Acorn Electron was more polished and professional than this. I can't pour enough scorn on this prime example of 'cashing in'. One to really give you thump. Flawed high score table. Each screen is loaded individually causing annoying delays. Sluggish joystick response and ropey collision detection. Ridiculous, primary school standard graphics, with flickery sprites. Slow and lacking any form of addictive qualities. The overall awfulness causes interest to wane after a couple of games.